Lawrie is an interdisciplinary artist and former government analyst who’s lived in the Yukon for over 35 years. Her practice has spanned many disciplines, each coming to the fore at different times in her life. In the mid-nineties painting gave way to theatre and writing, which soon merged with music and interdisciplinary performances. During graduate school, between 2011 and 2014, Lawrie re-dedicated herself to painting. Since 2011, her commitment to her practice has led to three solo shows and a significant body of work. She builds each piece intuitively, layering and at times scraping or sanding back— her palette dictated by season and place. She ascribes meaning to a panarchy loop pattern, which integrates motion, rhythm, vibration and pause into her painting and art-life process. In 2014, Lawrie graduated with a Masters of Fine Arts in Interdisciplinary Arts from Goddard College, at their Port Townsend, Washington campus. 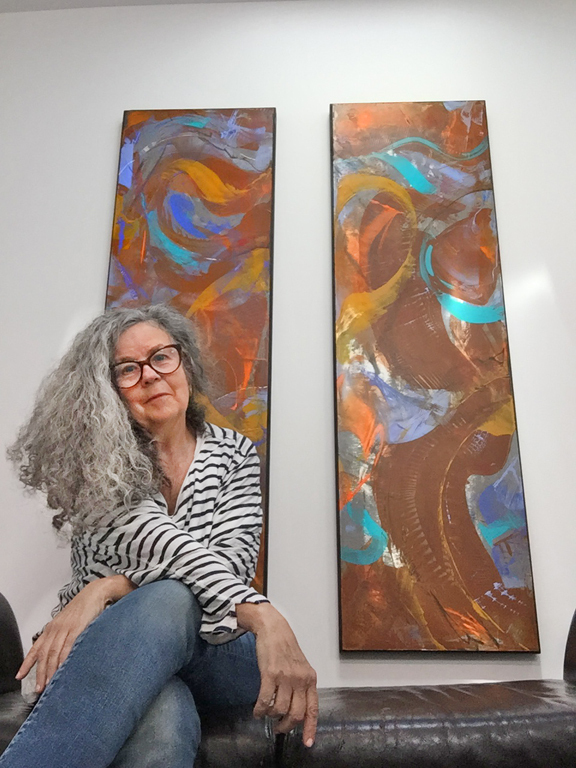 She is a founding member of the Southern Lakes Artist Collective (SLAC), and a member of the Yukon Art Society and the Hui No‘eau, on Maui, Hawai‘i. Her work can be found at Art Project Paia on the Hana Highway on Maui. For most of 2015 Lawrie was fully involved with SLAC's collaborative exhibition, Paper Rocks Scissors, which was presented this past September in Whitehorse Yukon. The story of how the exhibition came to be can be found by clicking... here for the Exhibition Catalogue. For 2018 she was consumed with the creation of her largest sculpture to date - a 2,200 square foot home/studio and gallery in downtown Carcross Yukon. Open as studio 303, visitors can call 867-334-7078 for an appointment. For those interested in more about panarchy and painting, see the portfolio link below.